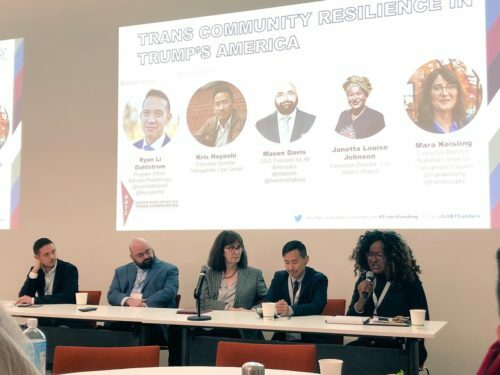 I recently attended the Grantmakers United for Trans Communities funder forum in Oakland, California in December 2018. It was the first of its kind and felt like a powerful, timely, and important space within this current political moment. Support trans-led groups, especially trans people of color and Black and Brown trans women’s leadership. Support an ecosystem of emerging and existing organizations (including organizations that have a mix of local, state, and national scopes of work). Trust trans-led organizations to determine best strategies to defend and support trans communities, especially in this political climate when trans communities are increasingly under threat and attack. Support the long-term well-being of trans leaders who are putting themselves on the line. Make rapid response grants AND be sure to listen to trans groups about emerging urgent situations to support the work in a meaningful way. Ensure leadership and staff are paid a true living wage. Recognize trans organizations are working on every issue that your foundation may be prioritizing—and fund them. Scale up investment by making larger and multi-year grants to support work led by trans and gender non-conforming communities. Overall, it was refreshing to see so many trans and gender non-conforming grantmakers, funder allies, and comrades who are committed to supporting trans-led work, and trans movement leaders together in one space. I look forward to seeing more new faces and institutions in the room at our next gathering. We still have so far to go to increase the mere 3 cents of every $100 in grantmaking across the U.S. that benefits trans communities. If you are interested in learning more about Grantmakers United for Trans Communities (GUTC) and/or would like to strategize about how you can move more resources to trans-led work, contact Alex Lee, GUTC Project Director: https://lgbtfunders.org/initiatives/gutc/. If you would like to connect with Borealis staff, grantee partners, funder allies, and others committed to increasing the funding of trans-led intersectional justice work across the U.S. and hiring trans and gender-non conforming staff members, please join us in January at the Creating Change conference in Detroit, MI for a reception that will be hosted by the Transforming Movements Fund and the Fund for Trans Generations. Details to be announced. Email FTG@borealisphilanthropy.org for more information or to join our email list.